Match day 6 of the season and our second league game Vs Doncaster Belles, in the first the game it ended with us winning 5-2. We were without Chloe and Courtney who both became poorly during the week, and long term absentee Danni Parker who will hopefully be returning in November, and Jiggy who was away this week.However we had been able to make the signing of Brooke Swann during the week, and Emily Casey returned after nearly a month out. We started the game really well, and broke the deadlock in the second minute through Daisy who has found her scoring boots again in recent weeks. The a lot of time past in the game, around 20 minutes when we won a penalty. Hannah who had not been on the scoresheet in her last two games, stepped up confidently and put it into the top corner. Goals were like buses for Hannah who got her second of the day 5 minutes later after a poor clearence from the Doncaster keeper, Hannah was able to lift the ball over her into an empty net. We then had a lapse in concentration and lost our clean sheet after a corner went back to the corner taker, who made her way into the box and fire past Lisa giving no chance. We were able to restore the 3 goal lead immediately though with a brilliant team game. Hannah collected the ball, and fired a fantastic ball out the debutant Brooke, who skipped past a player, and delivered an inch perfect cross to Daisy who finished with her first touch! Brooke and Daisy combined again when Brooke played a through ball to Daisy who completed a first half hat-trick! HT 5-1 - A brilliant first half for the ladies, not much of a team talk was needed except to tell them to keep doing more of the same, we were moving the ball incredibly well, and Izzy Wragg in particular finding a lot of room and supplying some great passes. Brooke and Olivia were torturing the Belles full back and our defence were doing a great job of containing them. The half started and soon after the start we got our second hat trick of the day when Hannah completed hers. She then grabbed her fourth of the day, and goal number 12 of the season, through a magnificent long range drive right into the bottom corner. Katrina then chipped in with the goals and Olivia did some great work down the left, found Katrina with a great pass who pass the ball into the corner of the goal. Daisy then matched Hannah and got her fourth of the game before getting a great applause when coming off. As the game went on Doncaster pushed more players forward, and 3 times in the final 10 minutes were 5 on 2 against Jodie and Nicole, after breaking past Rachel, but they were able to limit the score to only one with some great last ditch defending from both of them. We had a quick change around with Brooke going up top and Becs going out to the right. Both of them came really close to scoring, if not for a great save Brooke would have got a debut goal she deserved, and as Becs went to finish, fell and hurt her knee. Daisy then returned to the pitch and within seconds grabbed her fifth of the game, our 10th and the final goal of the game, and a great ball in from Olivia, Daisy firmly finished. 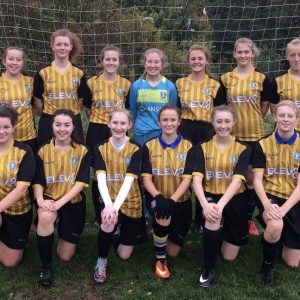 FT 10-1 – A wonderful performance from all the girls, playing some great football, moving the ball quickly, creating some great chances, and taking them when they came! 6 out of 6 for the ladies now and on to Rotherham United next week. Brooke got 90 minutes in on an impressive debut, and Emily returned getting a valuable 60 minutes under her belt, which can only benefit us. MOM – Isobel Wragg – Izzy has had a brilliant season so far, and this was her stand out performance of the season. Winning the ball several times through headers, interceptions and tackles. She was distributing quickly, supplying the wingers with some excellent through balls. She kept the tempo up for us, and switched the play at the right time. A brilliant all round performance from her, and was unlucky not to score in the second half.